The TF2 has both detailed styling and aggressive performance. You will find a balance of capability and performance built into every TF2. Authentic Looking Crawler Style Tube Bumper. Very High Quality Flexible Plastic, Very Durable, Very Scale. The R3 2 speed transmission comes with a fully machined billet aluminum case and wider gears to allow for more abuse along with a Delrin spur with slipper clutch. The designed motor mount is adjustable in 10 positions. The TF2 includes the Hammer Transfer Case. Packed with detail, the case features a cast metal exterior and the same new .8 Mod widened gears for durability. The Driveshafts for the TF2 are a design featuring bulletproof steel universals and a high quality plastic shaft for great driveline angles and durability on the trail. The TF2 includes a set of RC4WD Ultimate Scale Shocks. Designed for ultimate scale looks and ultimate performance. Machined from billet aluminum, rebuildable and internally sprung. The TF2 Chassis is a machined billet aluminum ladder frame design with leaf springs, scale shock hoops, chassis servo mounts and hard body mounts. 4-link conversion available soon! 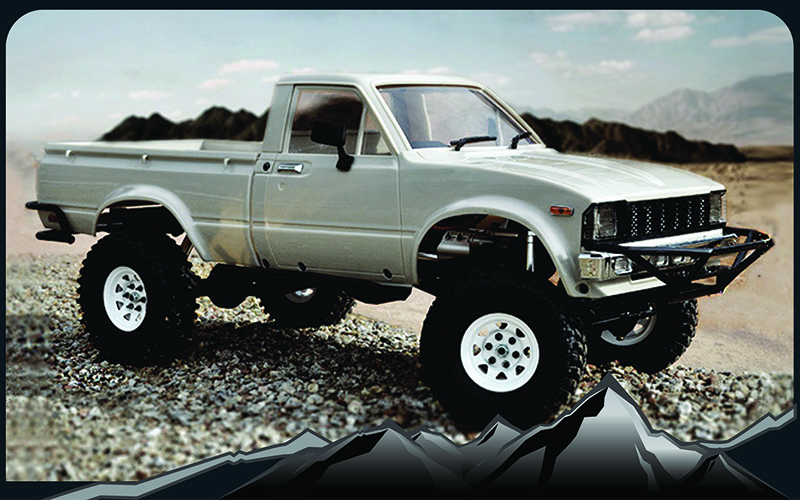 The TF2 includes a set of RC4WD White Stamped Steel 1.55" internal beadlock wheels. Super tough paintable white finish, aluminum internal ring and popular 6 lug design. The Mojave Body Set includes add on windshield wipers, mirrors, marker light details and door handles for the ultimate in scale looks. These items are also easily replaceable if damaged. The TF2 Mojave body features new late model style square headlights, chrome bumpers and a redesigned shape of the classic 4x4 body style. More accurately proportioned and better details. The Mojave Body Set includes a great dropped bed molded directly into the body. It's perfect for carrying all you scale accessories or spare wheel and tire! Another industry first, the TF2 Mojave Body Set includes a bolt on, scale accurate molded cab back with every kit so you can use just the cab for a truggy style build. The TF2 kit also includes scale rock rails plus front and rear tube rock guard bumpers. The front bumper has a winch mount built right in for an optional RC4WD winch. This was my first RC4WD kit build and it went together great! Easy to follow instructions and clear pictures. Make sure to use loctite in all the metal to metal locations and you will be good to go! Quite easy to build since most parts are already assembled... The 2-speeds transmission works like a charm, love it! Very scale looking truck, highly detailled... Leaf springs work great and make it runs like a real 1:1 truck! Best way to start your scale adventure! As always, the kit is very well described and should be no problem to build. Once finished it's a incredible capable truck with a lot of option to modify and personalize! Great product!